Nationality: French. Born: Paris, 15 September 1906. Education: Lycée Condorcet, and Schola Cantorum, Paris. Family: Married actress Françoise Fabian, a son, Jean, and daughter. Career: Became assistant to Jean Renoir, 1932; made first short film, Le Commissaire. . . , 1935; German prisoner of war, 1941–42; directed first feature, Le Dernier Atout , 1942; son and assistant Jean Becker completed Le Trou following his death. Died: 1960. Armes, Roy, French Cinema since 1946: Vol. I—The Great Tradition , New York, 1970. Beylie, Claude, Jacques Becker: Études, textes et scénarios inédits, entretiens, témoignages, florilège critique, filmographie , Locarno, 1991. Vey, Jean-Louis, Jacques Becker, ou, La Fausse Évidence , Lyon, 1995. De la Roche, Catherine, "The Stylist," in Films and Filming (London), March 1955. Lisbona, Joseph, "Microscope Director," in Films and Filming (London), December 1956. Baxter, Brian, "Jacques Becker and Montparnasse 19," in Film (London), September/October 1958. "Becker," in Sight and Sound (London), Spring 1960. Guillermo, Gilberto Perez, "Jacques Becker: Two Films," in Sight and Sound (London), Summer 1969. Lederlé, J. L., "Un Couple sans histoire," in Cinématographe (Paris), May 1977. Aubert, F., "Françoise Fabian parle de Becker," and Rene Predal, "Jacques Becker," in Cinéma (Paris), 11 December 1985. Chevrie, Marc, "Un Pur Cinéaste," in Cahiers du Cinéma (Paris), December 1985. Vignaux, Valérie, "Hors-la-loi et société criminelle dans les films de Jacques Becker," Positif (Paris), no. 419, January 1996. Viallet, Pierre, and Marcel L'Herbier, Portraits filmés . . . Jacques Becker , 1954. 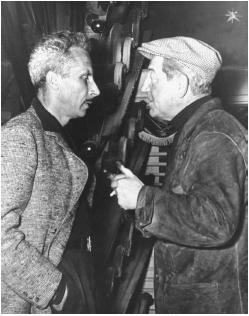 Next to Jean Grémillon, Jacques Becker is surely the most neglected of France's great directors. Known in France for Goupi Mains rouges and Antoine et Antoinette , his only film to reach an international critical audience was Casque d'Or. But from 1942 to 1959 Becker fashioned thirteen films, none of which could be called a failure and each of which merits respect and attention. Tied to Jean Renoir through a youthful friendship (their families were both close to the Cézannes), Becker began assisting Renoir in 1932. For eight years he helped put together some of the greatest films ever made, allowing the generous genius of Renoir to roam, unconcerned over the details he had already prearranged. Becker gave Renoir the kind of grounding and order which kept his films from flying into thin air. His fastidiousness and precision made him the perfect assistant. Many of his friends, however, doubted that such a sensibility could ever command the energy needed to finish a film. Nevertheless, film direction was Becker's ambition from the beginning of his career. It was he who developed the idea for Le Crime de M. Lang , and when the producer insisted that Renoir take over, it cost them their friendship for a time. Soon Becker was directing a cheap anarchist subject, Le Commissaire est bon enfant , with the Octobre groupe company of actors. He wasn't to be held back. Like so many others, Becker was given his chance with the Occupation. A producer handed Becker the reins of a detective comedy, Le Dernier Atout , which he brought in under budget and to a good box office response. This opened his career, permitting him to film the unforgettable Goupi. Georges Sadoul claims that after the war an American firm bought up the film and had it destroyed so that it wouldn't compete with American products as Open City had done. Whether this is true or not, the film remains impressive in the clarity of its partly cynical, partly mysterious tone. In addition, the work shows Becker to be a brilliant director of actors. The sureness of touch in each of Becker's films derives from a precision some link to craftsmanship; but Becker was striving for far more than competence, veneer, or "quality." He was first and always interested in rhythm. A musician, he was obsessed with jazz and ragtime. No other standard director spent so much time collaborating with his editor, Marguerite Renoir. Goupi is only the first of a host of Becker films whose subjects are difficult to define. Becker seems to have gone out of his way to set himself problems. Many of his films are about groups of characters, most notably his final work, Le Trou . Others feature widely diverse settings: Antoine et Antoinette captures the working class quarters of Paris; Rendez-vous de Juillet must be the first film anywhere to explicitly bring out the youth culture of postwar Europe; Falbalas evokes the world of high fashion as only someone raised in such a world could know it; and, of course, Casque d'Or makes the turn-ofthe-century Parisian underworld come to life with a kind of grim romanticism. Becker stated that his fastidious attention to milieu was the only way he could approach his characters. Bazin goes further, claiming that only through the exactitude of social particularity could the universality of his characters and their situations come to life. For Bazin, Edouard et Caroline is, if not his greatest film, at least his most revealing one. This brilliant farce in the style of Marivaux is virtually plotless. Becker was able, via the minuteness of his découpage and the sympathy he had for his actors, to build a serious moral comedy from literally nothing. Edouard et Caroline , along with Le Trou , shows him working at his best, working without plots and without the luxury of breadth. Both films take place in prison cells, Le Trou in an actual prison, Edouard et Caroline in the dingy apartment they share and the more menacing jail of her uncle's mansion. Becker has been called "the mechanic" of cinema, for he took a delight in its workings and he went about his own job with such order and method. This separates him further from such "quality" directors as Autant-Lara, Cayatte, and Delannoy, whose themes may seem grander. Becker was interested in what the cinema could do just as he was interested in what men and women do. Never searching for the extraordinary, he would go to endless lengths to bring out not some abstract rhythm in the lives of people (as René Clair did) but the true style and rhythm of their sensibilities. In 1956 Max Ophuls bequeathed to Becker his project on the life of Modigliani. While the resultant film, Montparnasse 19 , is one of his least successful, its style is illustrative. Within weeks after Becker assumed control of the project, both the scriptwriter (Henri Jeanson) and the set designer (Annenkov) left in outrage, for Becker refused to let them show off with words and drapery. His was always a reduced idea of cinema, even when, as in Falbalas , his subject was fashion. Nor did he ever choose name actors, except perhaps Gérard Philipe as Modigliani. He had a sureness of taste, backed up by scrupulous reflection. Becker viewed filmmaking as an endless series of choices, each of which could founder the project. Truffaut once claimed that Becker had his own pace of living; he would linger over meals, but race his car. He would spend hours of film over minor incidents in the lives of his characters, while whipping through the core of the intrigue that brought those characters together. Perhaps this is why Le Trou is a fitting finale to his career. For here the intrigue is given in advance and in a sense is without interest: five men struggling to escape from jail. For two and a half hours we observe the minutiae of their efforts and the silent camaraderie that develops among them. This is, for Becker, the state of life on earth: despite the ingenuity we bring to our struggle for freedom, we are doomed to failure; but in the effort we come upon another value, greater even than liberty, an awareness that our struggle is shared and of the friendship and respect that shared effort confers. If Casque d'Or is destined to remain his most popular and most acclaimed film (it was his personal favorite), it will not betray these sentiments, for the character of Manda gives up not only liberty, but also life with Marie-Casque d'Or, in order to be true to his friend. The stunning scene at the guillotine which ends that film evokes a set of emotions as contradictory as life itself. Jacques Becker was uniquely able to express such contradictions.